Just a quick note to let you know that MAKE Magazine has published their first comprehensive guide on 3D printing, called the Ultimate Guide to 3D Printing. But now that I’ve got you all excited, I have to tell you that it won’t be available until Tuesday, November 20. (If I had read MAKE’s announcement more carefully I would not have driven down to Barnes and Noble this morning looking for it.) 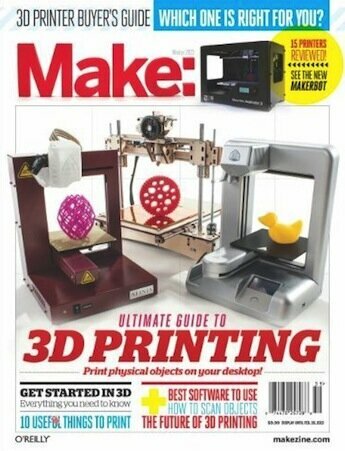 On Tuesday you can either head down to your local newsstand, or you can order an electronic copy of it from MakerShed. I tried to buy a copy of it online today for $9.95, but MakerShed apparently is not letting them out the virtual door until Tuesday either.